So I don't think the statement 'the rise is happening anyway' really paints a complete picture that is faithful to evidence. Nor was it intended to paint a complete picture, but as the "anyway" part is the larger part of the rise, it cannot be ignored. You would put no money into adaptation? My concern then, if the money was successfully spent, is that you merely delayed the rise by a few years. Places that were vulnerable to only a few decimetres would already have taken the damage, and those rescued by the few cm offset by the money [more than a trillion could be needed, though] would still be next. You would put no money into adaptation? No, I would put some nonzero proportion of the money to adaptation, I just said it with slightly different words. Just to give a couple examples, I think actions to ensure the availability of freshwater to regions projected to be most severely affected are wise to pursue. Sea level rise and enhanced storm surge vulnerability is another aspect that should receive attention, and thankfully some cities/governments are already looking into this. It tends to be a very costly solution, however, and I do have mixed feelings about it. Seems sound to me, though I don't know if awareness alone will prove to be enough. I think people's willingness to accept the notion that climate change and freshwater conflicts will start wars is somewhat telling about the attitude of today towards climate change. If it's thinkable and pessimistic, it's kosher. I'm saying that because there is little in history to support that wars start that way. It's a science fiction scenario, but anything is possible of course. There is evidence that it can happen, none that it can't, but we cannot from that conclude that it's more likely to happen than not. It is true that access to water sometimes becomes a part of an armed conflict, but they hardly start that way. I mean, warring nations have often wanted to control their enemy's broadcasting, but wars aren't started because a nation wants its neighbour's national radio or TV. And even if two countries sometime in the future did go to war over a water dispute, the link to climate change would still have to be proven. Yeah, I don't think (or I hope it's not true) that anyone supposes that it is purely climate change or freshwater availability that starts conflict, but rather that it can exacerbate the socio-economic issues already present and thus push towards open conflict, as seen in the middle east. Any portrayal of the start of a war being due to just one variable is very likely a serious simplification. Please try to pay attention to what and where you're posting. My belief in any "global warming" theories was severely undermined this summer, comparing to the previous ones. Those years were quite warm, and there were many instances of forest fires and long periods of dry, sunny weather. But this time, summer was quite cold and humid, I couldn't use my bike in August and September because of constant rains. My trip to Moscow Air Show was interrupted because of that. After 20 September temperature was already below 10 C, and finally, 3 days ago there was 0 C and a first snow 1 month before the climatic norm. Many trees just started to turn yellow, and there were many green leaves, and the snow, being humid and sticky, landed on them, so that many trees ended up broken under its weight. I haven't seen something like that in years. There is no room for 'belief' in science. I do not believe in evolution, I do not believe in the Big Bang, and I do not believe the laws of thermodynamics. I accept that these are all experimentally validated statements and models of how the universe works, supported with a strong understanding of the underlying processes. Global warming theory is no exception, and indeed is a natural extension of thermodynamics applied to the Earth system. Examination of annual temperature and climate patterns, especially regional or local, is a very poor way to determine the status of global warming or climate change. Although regional climate is affected by global warming, and the trends can be predicted to some degree by climate models, these trends are seldom simple, and over short timescales are easily masked by natural variability. Instead, you should look at global patterns over decadal timescales, for which the signal of global warming is obvious, as was pointed out in quite some detail on the first page of this thread. Watsisname, you are being too serious about that matter. On the level of science, I simply do not have sufficient information to judge whether those are true or false theories, so the only valuable thing for me is some sort of belief. I can believe the scientists, politicians, newspapers and Internet, because I have no other source of information to be sure about. Except my own eyes and ears, of course. It is entirely different matter, so may I remind you that instead of complaining about my personal values you'd better listen what some people are trying o tell. Seasons get warmer, seasons get colder, but only thing that we can possibly make out due to our constant observation is that weather is changing, climate zones are shifting and it continues on forever. It is scientifically not valid to summarize all these processes into one median parameter, mix all information it in some proportions and shove it down everyone's throat with exceptional urgency, using such words as "obvious" and "global patterns" . I am not complaining about your values at all. I'm just trying to help you to be a good critical thinker. You have plenty of information available to come to an educated conclusion about global warming, but if you don't want to put in the effort, that's fine, too. "I don't know" is an acceptable answer. But by stating that your observations lead to you conclude that the validity of global warming theory is diminished, you are making a scientific argument, which in turn is open to scientific discussion. I am pointing out to you that the methods by which you arrived at your conclusions are flawed, and I am trying to show you the correct way. It is scientifically not valid to summarize all these processes into one median parameter, mix all information it in some proportions and shove it down everyone's throat with exceptional urgency, using such words as "obvious" and "global patterns"
This is another argument and it is again incorrect. There are many ways of quantitatively examining changes in the earth system as affected by global warming. The most obvious method is to look at globally averaged surface temperature. You can also look at tropospheric temperature, upper stratospheric temperature, temperature over land, temperature over ocean, temperature of the ocean and at different depths, the melting of glaciers and ice sheets, the thermal expansion of the oceans, the abundance of tropospheric water vapor, and radiative flux between the surface and space. These are all simple metrics which correspond to the object of interest -- the increased radiative forcing due to increased greenhouse gas concentrations in the atmosphere. All of these observations lead to the same conclusion -- that human activities are warming the planet. I’m sending you a report of the monthly means in Green Harbour and an explanation by meteorologist Birkeland, where he states his opinion that there must have been a change in the thermometer setup, since the climate seems to have become milder during the recent years. While not denying that there can be temperature fluctuation in the arctic regions lasting such a long time as this, I’d still like to ask you whether you’re aware of any change in the thermometer setup, or in anything else that could influence the temperatures that are recorded. The reply was that there had been no changes. 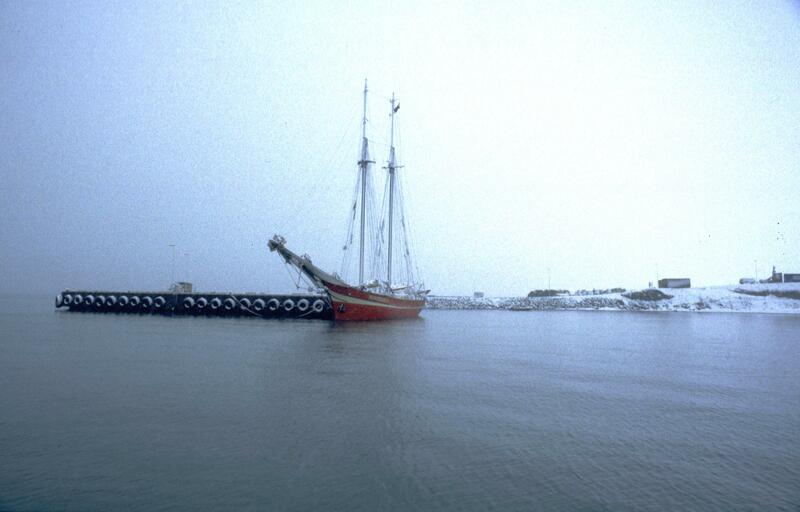 Green Harbour is in Svalbard, near today’s town of Barentsburg. Birkeland apparently didn't believe the readings since winter temperatures had gone up with 10 °C in just a decade even after making multi-year averages. But later the arctic cooled slowly but considerably, and now the warming history repeats while it remains to be seen if the temperatures drop again. Currently there seems to be a pause with no clear indication that temperatures will drop (other than from trusting history). Certainly don't trust the predictions of ice free summers (the guys who in 2007 predicted 2013 were obviously wrong). I find it troubling that AR5 has a graph supposed to show the arctic summer sea ice extent since 1900, and it shows no sign of the dramatic sea ice decline reported in the 20's. Yep. The reality is that there is natural variability across a range of spatial and temporal scales, and this really should not be mysterious or surprising. Being an astronomer, I sometimes like to make the comparison to galaxies on the Hubble Diagram: there’s a lot of spread due to local motions of the galaxies through space, and you can even find galaxies that are approaching us rather than receding, but there is a clear underlying trend of increasing recessional velocity with increasing distance, and there is a well understood mechanism explaining why this is so. Similar idea with global warming: there are a huge number of natural cycles and seemingly random variability, which should make sense because the Earth is a complex assortment of interconnected systems with both internal and external forcings. Take this system and introduce a new forcing, by increasing GHG concentrations in the atmosphere, and you expect to see a long term positive trend in the temperature overlaid on all that variability. And that’s exactly what we observe. Commentary on the arctic’s enhanced warming during the 1920s and the period of cooling following that. a) Sea ice extent did not respond very strongly to the higher temperatures, since it was a relatively short-lived pulse. 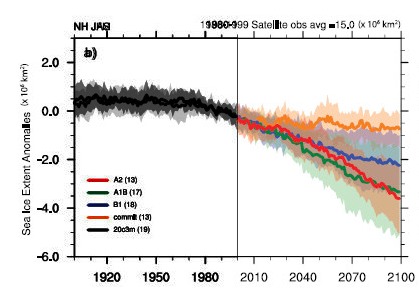 b) We don’t have a homogenous record of arctic sea ice extent before the satellite era, so there is a fair deal of uncertainty in those curves for that time period. Nevertheless, the effect is visible. And by observation, proxy, and available historical data (it is not only the use of models that take us past the instrumental/observational era), we are highly confident that the state of the arctic now is unprecedented in the last thousand+ years. Certainly don't trust the predictions of ice free summers (the guys who in 2007 predicted 2013 were obviously wrong). Have you compared that prediction to the consensus prediction among climate scientists, which is an easy thing to do by looking at AR4 (which was also published in 2007)? As you can see, that group’s 2007 prediction of ice-free summers by 2013 was an extreme outlier. I highly doubt anyone else in the climate science community took that prediction very seriously, but unsurprisingly the media went absolutely nuts over it. (Doing it for attention maybe? Who knows?) Anyway the consensus in 2007 was that mostly ice free summers in the arctic are unlikely before 2100. 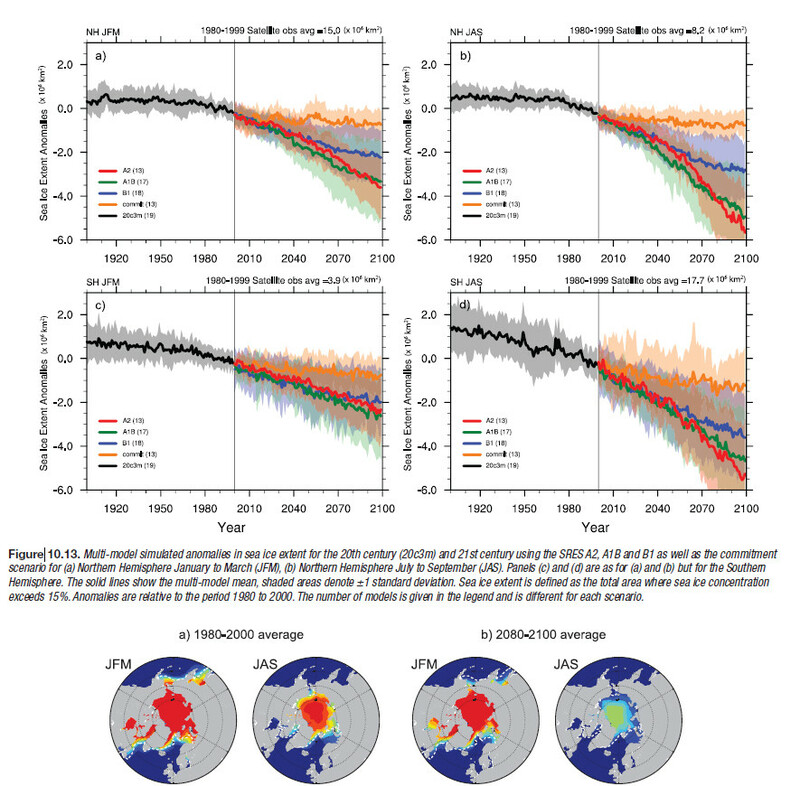 In AR5, with improved understanding/modeling of the dynamics involved in ice loss (it is an extremely challenging modeling problem), the consensus is that they could occur sometime after 2050, with still significant uncertainty and high dependence on emissions scenario. There is indeed much uncertainty, but the AR's claim otherwise judging from the graphs, don't they? In AR4 it seems odd that the ±1 standard deviation for the NH is narrower in summer than in winter, since winter extent is much constrained by land masses. Also some SH models seem to have derailed from recent observations. We have little ice data, but I think we should take the many reports from amazed fishermen, trappers and scientists of the 20's seriously. In the AR4 JAS graph, which should be most relevant for these reports, I can't see even a hint of a dent. We do know that the area warmed rapidly, but sea ice is not always a function of temperature. Wind and sea current patterns matter a lot. Still, reports of vanishing sea ice did happen to coincide with the higher temperatures. As you can see, that group’s 2007 prediction of ice-free summers by 2013 was an extreme outlier. Yes. It all depends on the timescale used for extrapolation. 2013 was a fair estimate if you take 2007 as being on a trend constructed from a small timescale. If you choose a longer timescale the ice disappears later. My point, however, is that if the current retreat is like the one in the 10's-20's-30's, we can't extrapolate from it, unless we decide that the retreat didn't exist contrary to eye witness reports. Extreme natural fluctuations happen in the arctic all the time disturbing even decadal trends. One or two years certainly can't be used to tell anything. The only time I've had an opportunity to get to the extreme north of Svalbard, in 2000, the ice made it impossible despite extremely favourable conditions in other years. Even in the peak of summer, in late July, we had snow on a daily basis. On 28th July 10cm of snow settled on the beach. In the Svalbard airport series, now reconstructed to go back to 1902 (not very useful for climate studies before 1975 in my opinion), a record low minimum for July of -0.7 °C was set that day. The previous record was +0.2, so it was a pretty impressive record considering that summer temperatures rarely deviate by more than a few degrees, certainly not on the lower side. Even in the midst of an extreme warming period, anything can happen it seems. 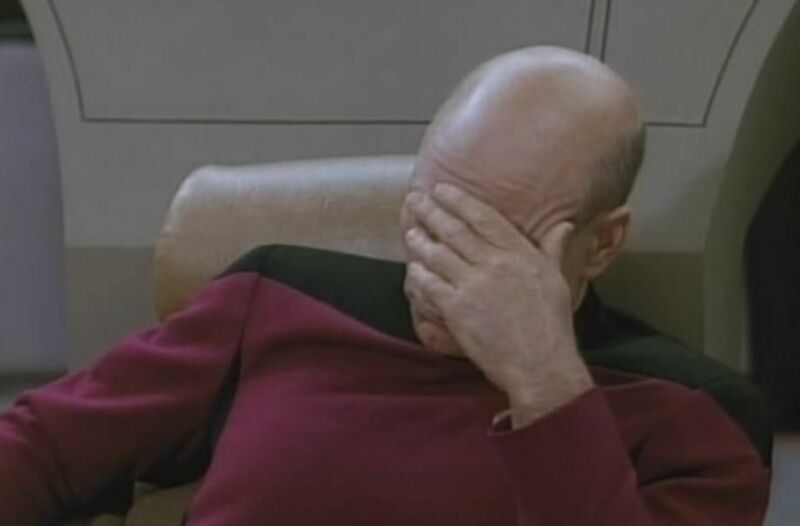 ADDENDUM: I think one clarification regarding uncertainty is in place. Perhaps obvious, but there is no direct mapping between uncertainty [of facts] and the degree that different models/reconstructions/homogenisations diverge. Actual uncertainty ought to be an independent statistical study. The error bars are shown and they apply to the entire timeseries (Walsh & Chapman, Hadley) before the satellite era. You an also see that the error is higher the farther back you go, which should make sense. In AR4 it seems odd that the ±1 standard deviation for the NH is narrower in summer than in winter, since winter extent is much constrained by land masses. No again? Look at the figure and compare the size of the error bars from JFM (winter) to JAS (summer). They are consistent with your intuition of what they should be, with the uncertainty in summer extent being greater. Edit: Sorry, I missed that you said in AR4, not AR5, but it looks to be the same way, judging by AR4 Fig. 4.10. You even see a very nice response to the warming in the 1920s and the cooling following that in the data for April Nordic extent and September Arctic extent. And if we look at the whole figure, we see the negative trend due to global warming, with natural variability overlaid on that signal. Just like what I was saying with tropospheric/surface temperatures, there's nothing really surprising about it. JFM mostly contains the JAS grey area. And I don't see anything going on in the 20's apart from very low noise. What I am missing here? Are we discussing error bars in absolute terms (km²) as in that graph or relative (%) here?